There are times, when life is busy, when a vintage literary mystery is the perfect bookish prescription. When I needed that prescription I picked up this book, and it was perfect. 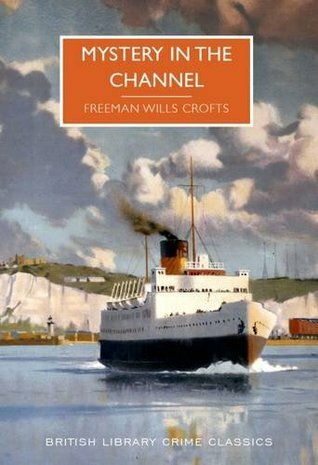 It begins with a passenger ferry in the English channel, sailing from Newhaven to Dieppe. Captain Hewitt sees a yacht adrift, with a man lying motionless on the deck. He sends a small boarding party and they find that the man has been shot dead, as has another man they find in the cabin. There is no sign of a murder weapon, or the murderer. Another man arrives on a motor launch. He is John Patrick Nolan, and he had come to join two of his partners in Moxon’s General Securities on a business trip, to meet a French financier named Pasteur in Fécamp. He identifies the two dead men as Paul Moxon, chairman of the firm, and his vice-chairman, Sydney Deeping. Back in England the investigation falls to the Sussex Police, and to Inspector Joseph French of Scotland Yard. It appeared that Moxon’s General Securities was on the verge of collapse: and that maybe the partners, unable to meet their obligations, were fleeing the country with £1.5 million pounds in cash that was missing from the company’s strong room. The investigation would be complex. It took in many people involved with and affected by events at the failing finance house; detailed nautical calculations and timetables; and the serial numbers and whereabouts of the missing notes. It wasn’t difficult to follow. I didn’t try to work too much out, but I enjoyed watching capable professionals doing their jobs; and following the investigation and all of different developments. The plot was very well constructed. The characters were drawn simply; just clearly enough to allow the story to move forward. Many of the details if the story still resonate: particularly the business failure, the executives abdicating responsibility and absconding, and ordinary people suffering life-changing losses. Technology has changed, the figures have changed, but almost everything else would be exactly the same today. I appreciated that many of those working on the investigation had genuine concern for the families of the dead men and for the many people affected by the collapse of Moxons. There are many days when I would rather read a mystery with more complex characters, with a plot that held more surprises, and with a story that was a little more profound. But on the day that I read this book it had exactly the right amount of mystery and real human interest to engage and to entertain. Sounds like the perfect book for just when you needed it, Jane! Sometimes a book just hits the spot. A couple of you have been featuring these British Library Crime classic books. I love the look of them. Sounds like you chose the right book for the day. I am in the mood for one of those books and days. Enjoyed! I did, and a great many of the series would fit the bill perfectly on that kind of reading day. It sounds just what you described – a book to read on those crazy busy rushed day! Great review!! Thank you – I’d call this the literary equivalent of a friend you meet, are delighted to see and can talk with happily and naturally. I read a couple of the BLCCs over the holidays and they worked a treat as ‘wind-down’ books amidst the hustle and bustle of Christmas. This one sounds lovely – I shall keep an eye out for it. That sounds like very well planned reading. I’d certainly recommend this one for similar times, and I can say its one of my favourite BLCCs. The perfect book, just when it was needed – so good when this happens. I know a good few people who are getting a lot out of these BL Crime Classics. Hope the busyness has eased now. I’m still busy but I think I have the juggling of things working a little more smoothly. I can understand the popularity of these BL Crime Classics, because that do a very particular thing very well. Like you I always turn to an “easy read” mystery when life is too busy and I just love the covers of this series. I will have to look out for this one, I bought one at the weekend which is about a plane journey by the same author so clearly the allure of travel was their specialty. Yes, the covers are lovely and I’ll certainly pick up more by the author as I like his style and I like a travel book. It sounds as if the plane book could be an interesting variation on the closed group mystery, like this one. The are so tempting. I’ve waited for library copies of some but I haven’t been able to resist downloading others. I’m sure I have a Freeman Wills Croft book tbr but I can’t remember which one and it’s downstairs and I am in bed. Still, this sounds perfect comfort reading and another hit from the BLCC. This was, and I hope that whichever book you have will be as good when you feel the need for comfort reading.